My ELK (ElasticSearch/LogStash/Kibana) cluster isn’t working. How do I fix it? There is no standard logstash port, so check your server configuration for the correct value. If you can reach the server manually, then your shipper should be able to as well. If you cannot reach the server with telnet, then you have some networking or connectivity issue. Go work on that! If you’re using the full logstash agent as your shipper, run it with “–debug” and check its own log files in /var/log/logstash/. For logstash-forwarder, run it with the “-quiet=false” flag (0.4) or “-verbose -debug” (older) flags. Check the list of filenames that you’ve configured – do they really match your paths? Do any wildcards expand as desired? In logstash-forwarder’s debug mode, it will show you the list of files that it’s processing. If you can cannot reach the server, check the network. This instructs logstash to print out a copy of each message that it processes. These are usually written to /var/log/messages. If information is being printed to the logs, then the shipper is sending good data to logstash. Check the “@timestamp” value in these records. By default, the documents will be written to an elasticsearch index according to that date. Don’t forget to disable the extra “output” section, or you’ll run out of disk space pretty quickly! Logstash also has “–debug” and “–verbose” command-line options that you can enable in your startup script, e.g. /etc/init.d/logstash. If you run this a couple of times, you’d like to see the number increasing. 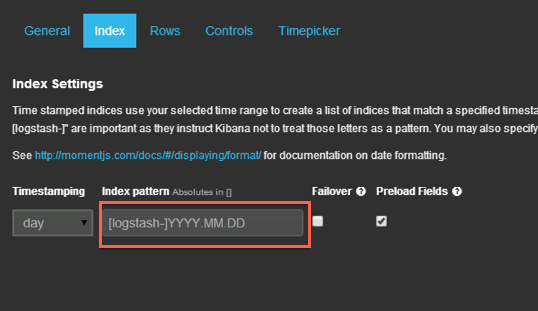 Second, make sure that your kibana date range covers the dates being used when documents are added to the index. If the date is being overwritten (using logstash’s date filter), the logs will be in the past. If the date is not being overwritten, the logs will show at the current time.